The other day I picked two buckets of peaches, many still partially green, from our tree. Now I stand at the kitchen sink, picking out the ripest ones and quartering them. The worms have gotten there first, so by the time I gently scrape out and cut around the brown mush they have created, and peel off the skins, I have only small chunks. They are not that big to start with, these white peaches, and so it takes 10 or 12 peaches to get even two cups of small pieces, enough for a snack bag. I dump them in, press it flat, getting out all the air, and slip it into the freezer. And start again. Because they taste delicious, and they are mine. I know for a fact that they have never been sprayed with a noxious pesticide and their fertilizer is our compost and leaves from the yard. They’re like family. As I work I try negotiating with the worms. How about next year we work out a deal, I suggest? You guys get all the peaches on the east side of the tree and I’ll take the west (not foolish enough to vie for the south side that gets more sun.) 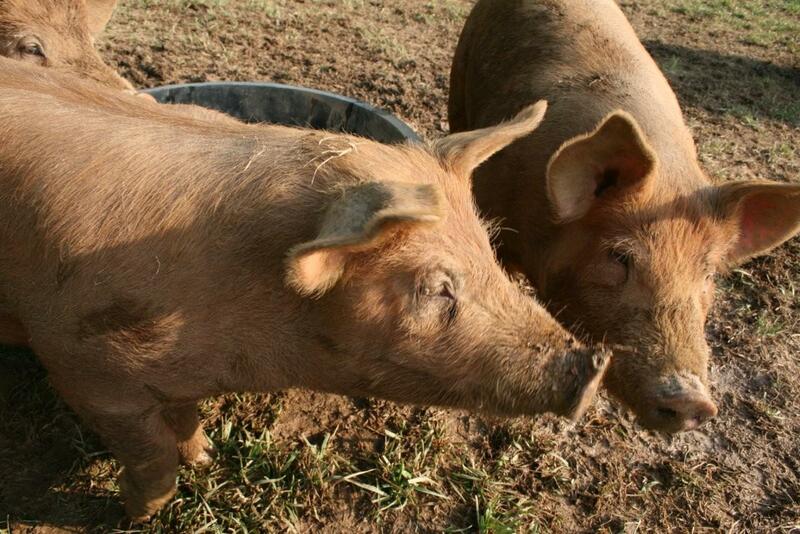 But they’re not very cooperative, nor communicative. But that’s okay. About ever 7th or 8th peach I get a pleasant surprise. No worms! I got to this one before they did! And the bag fills more quickly. It takes a while, but in the dead of winter, when there is nothing but fruit from faraway places in the stores, fruit that flew thousand of miles just to get here, I will be able to pop a few chunks of North Carolina peaches into my breakfast cereal. And it will make my day. Hopefully I will also get enough to make some peach muffins for the August Kiln Opening here at the pottery. I saw a wonderful bumper sticker yesterday. 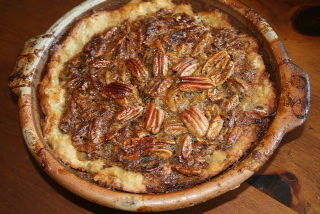 “Local Foods, Thousands of miles fresher” (from AppalachianGrown.com). And thousands of miles more sane. Here in Chatham County we can grow food all year long. And with the help of a freezer, or some canning equipment, and our farmer’s markets, we can eat local fruits and vegetables most every day. Which takes me back to these peaches, and the way they connect me to the land we live on. 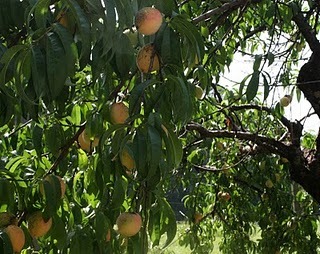 We planted this tree many years ago and I remember picking peaches with Emma and Meg when they were little, and making peach cobblers at Christmas. If you don’t have your own tree, treat yourself to a basket of local peaches at the Chatham Marketplace, or your local farmer’s market. You may not find any worms to talk to, but you can skin and slice and find your way into a few bags for the freezer. Hopefully in a few months you will pull one out and smile. And I’d like to think, those local Carolina peaches will make your day too. Wednesday was an exciting day at the end of the Johnny Burke Road in Pittsboro, NC. Mark and I had the pleasure of being the very first ever CSA pick-up from Duck Run Farm, owned and run by the multi-talented Keenan McDonald. 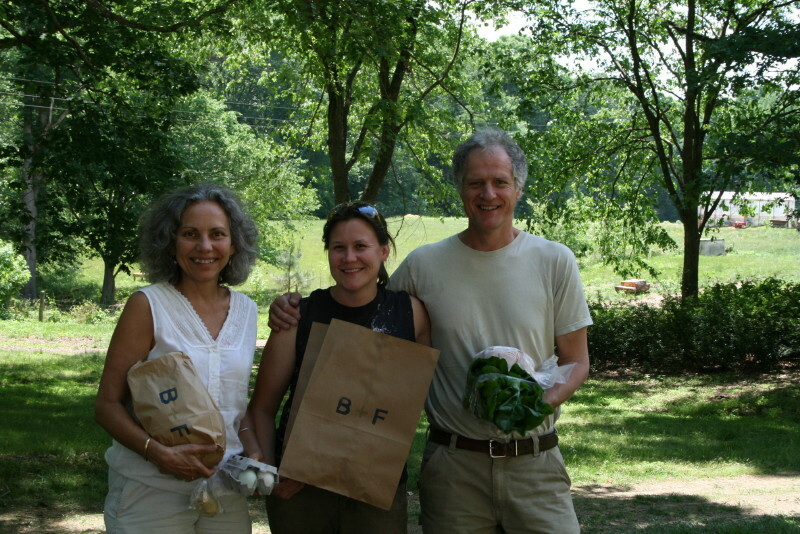 In August 2009 Keenan took on the transformation of the old Burke family farm, which we share. She brought in baby pigs to turn over the ground and a wonderful selection of the most beautiful ducks to class up the pond, while she began turning the large room off the breezeway into a certified kitchen. A chicken “tractor” was built and soon filled up with chicks, and a greenhouse sprang up on the crest of the hill. A shelter and brick oven came next, and when the acres up on the hill were ready, tiny plants soon became long rows of spring vegetables. We offered use of a tractor, and Keenan came down to help hoist Mark’s very biggest pots off the wheel. Big projects rely on extra hands and we have enjoyed being those for one another. But mostly we have been her cheering section, arm-chair quarterbacks to her impressive undertaking. Farming is work, and more work, but one also needs drive, passion, intellect and ingenuity to turn earth and seed into a successful business. Duck Run Farm has all those and more. The spring yield is excellent – the hilltop of kale, chard, spinach, lettuces, bok choy and more are inspiring and selling well on Tuesdays at Fearrington Farmer’s Market, Wednesday evenings at Johnny’s in Carrboro, and Saturdays in Saxapahaw. Those baby chicks grew to healthy fat birds, and have been processed and now wait in the freezer to be included in the CSA bags. Baker+Farmer, an apt title, takes the CSA concept to a whole new level as Keenan collaborates with other farmers, a goat dairy, a baker, and even a coffee roaster! Our bag included a tasty piece of garlic-and-chive goat cheese from Small Potatoes Farm, a fat frozen chicken and the most wonderful round loaf of crusty bread by the talented baker Lynette Driver. That loaf didn’t last long: We were tearing off large chunks to enjoy while it was still warm as we walked back down the lane to our house. While we collected our bag about noon many more bags were being delivered to Family Health International and EPA in Research Triangle Park, the School of Government in Chapel Hill and beyond. In the end sixty bags went out to very lucky customers on this inaugural run. 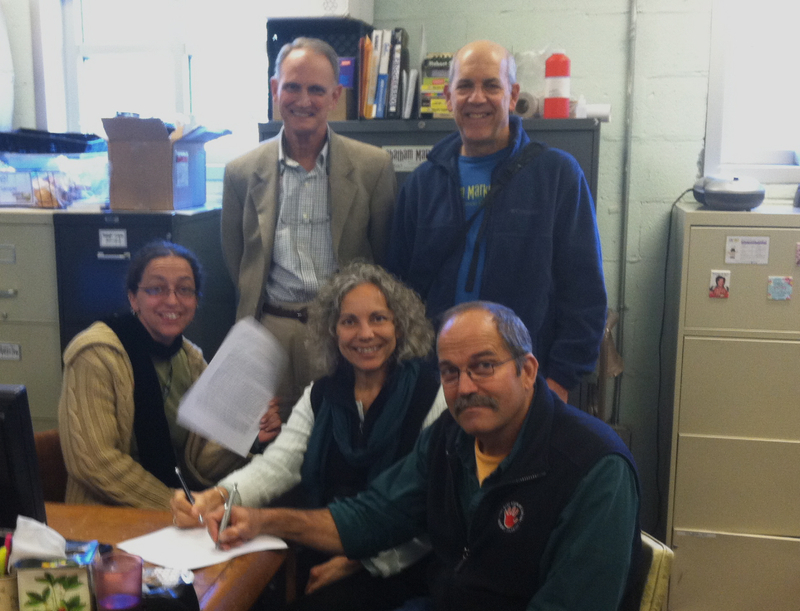 On May 5th, 2010 the world of sustainable agriculture took a tiny leap forward. I felt it. I was there. It was wonderful. Keenan has plans for dinner events and music on a stage, so bookmark her site and come and hear the ducks happily quacking down at the pond for yourself. I’ll be there. Just eating and dancing and celebrating the way we are making our foodshed and our community the way we really want them to be. At the four-day Shakori Hills GrassRoots Festival of Music and Dance held every spring and fall in Silk Hope, NC, we try to model sustainability. Yes, that means we want the festival to survive and flourish. We also want to reduce our carbon footprint, and to model and teach the moral imperative of caring for our planet while strengthening the community created during the event, as well as the larger one in which we live, work, and dance. Which brings me to ice cream. We have been using a Raleigh-owned business, but their ice cream came from the massive big-box store with the best price. Where was it made? We didn’t know. Ingredients? Farming practices? Not sure. But where else can they easily buy over 100 gallons of ice cream in one weekend? 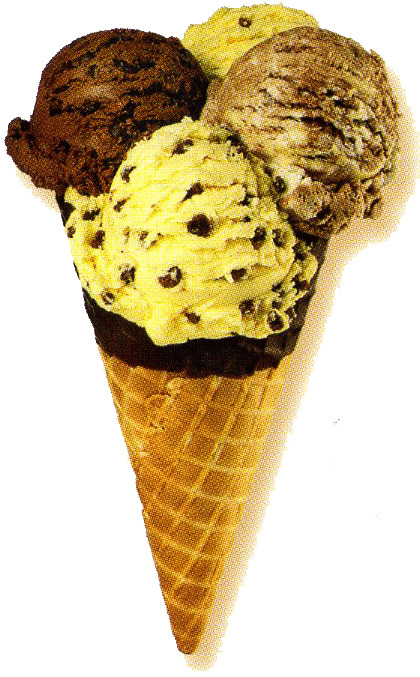 If you’d like to cast a vote for a specific creamery (or flavor) now would be your chance to do just that. Leave me a comment to let me know. I will be looking for a few dairy-free options as well. Now I just need to find some local cones! At the end of a recent Local Lunch Friday Jason and Haruka presented us with a dilemma. They operate EdibleEarthscapes, and they were overstocked with daikon radishes. They brought boxes of daikon to the kitchen, and have hundreds more plants in the ground. Sandi from ECO said she didn’t need them, as she is flush with daikon right now. I suggested we take them to the Asian markets in Cary to see what we could sell. Lyle jumped at the idea. “Do you know where those stores are?” he asked. Lyle has never shopped at an Asian market, and being on a hundred mile diet, it is unlikely he will shop there any time soon, as they specialize in faraway foods. Plus, Lyle says he doesn’t get out much. So the challenge was on and we set off with a box of big white tuber looking radishes. The mission was simple: come home with an empty box, a fistful of cash, and a buyer for the many boxes that would soon follow. We showed him a sample and he led us to the produce section to compare it with their selection. Theirs were much bigger. And tougher. And cheaper. We were up against the Shanghai price. We countered that ours might taste better and out came a knife. Next thing we knew we were cutting samples and performing live taste tests in the aisle. The produce manager preferred their hotter radish. The young woman from the customer service desk preferred ours. 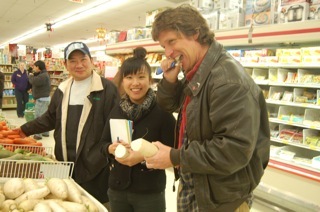 Lyle commandeered an unsuspecting shopper to try each one and she preferred our daikon! Score! EdibleEarthscapes took the lead! Our product was a bit more expensive, but we worked out a deal. They asked us to come back with a pretty sign that explains these are fresh, local, sustainable, and whatever other good “shelf talk” (as they say in the business) and they’d set up a separate display to see how they sell. They would also need to be individually wrapped or marked with a stamp on them to distinguish them from the other, less expensive product. OK. We could take the idea back to Jason and Haruka for consideration. They sell fifty boxes a week. The trick is to deliver them into that market profitably. Stop number two was the Triangle Indian Market on Chatham Street. I had met Nagi, the owner, before. He is an excellent businessman who not only owns the grocery, but also several restaurants and a movie theater. He and I had talked previously about finding local farmers that would be interested in growing some of the vegetable varieties he now imports from overseas. He was not there, but we got his card, took a good look at the vegetable offerings-where daikon was called “muli.” Here we were up against the Miami price, and out of luck. We would have bought a couple of warm samosas for the road, had we not stuffed ourselves with cabbage pancakes and homemade mayonnaise at Local Lunch. The woman we showed our sample to said that only the people in the north of India would eat such a thing. Interesting. Third stop was the Punjab Indian Restaurant across the parking lot. North or South India, we weren’t sure, but we took a radish in and asked to speak to the chef. The hostess that greeted us shook her head. The chef wouldn’t want any, but how much did they cost? She might take one for herself. “One dollar,” Lyle said, before I could jack the price. A second woman nearby said she would take one as well. We closed the deal and moved on. Back in the car Lyle called it a “sympathy sale,” since we were cold, and wet, and bedraggled looking. Fine, but we now had two dollars! Lyle forced me to stop at a Korean restaurant he had spotted, assuring me that daikon would be big in Korean cuisine. We met the owner and she was gracious. She held our sample up lovingly and explained that it was only the Chinese that would eat such a thing. Next stop was Patel Brothers, another Indian market. Again I showed our sample radish to the owner. The customers in the checkout line seemed interested as well, so I asked to borrow a knife to carve off some more sample pieces. “Oh no,” the man behind the check out quickly informed me. “They will not eat “mooly” in the afternoon, just the morning, because it ruins the breath.” Great. So much for my breath, which had clearly been ruined a few stops back. And now we have another word for daikon. Lyle had cased out the produce section and noticed that their box of daikon radish was almost empty. He was convinced they would buy our entire box if we got the price right. Lyle brought the box in from the car and the fellow at the checkout began piling long radishes on their counter scale. After eight or ten they began to roll off. My suggestion that they not try to get them all on the scale at once fell on deaf ears. After a couple of avalanches they held. 16.18 pounds, and we got our cash. A customer asked if we had brought the leaves. Darn. Not a one. They are very good cooked she said, and I promised to bring some back for her. Have we discovered another saleable product that is usually ending up in the compost bin? Now that would be exciting. Going door to door with Jason and Haruka’s daikon was a tremendous success. We learned a lot. We made several connections that may pay off later and we got useful feedback everywhere we went. We went out with a full box and came home with an empty box and a bit of cash, so that counts for something. 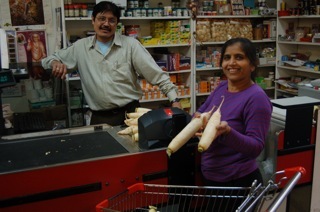 And we found out that the Asian markets are not a panacea for selling surplus daikon. And what a blast. If we are going to re-engineer our foodshed, we are going to need to pay this tuition, to go talk to the grocers and get a thorough understanding of the markets we are playing in. Overstocked on daikon? Better knock on some doors. Market research. What better way to spend a dreary February afternoon?